Laid-back Laguna joint attracts locals with casual, Baja-inspired Mexican fare. 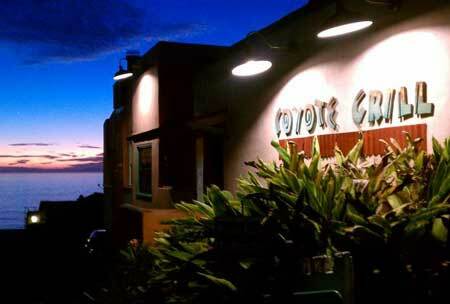 : Coyote Grill has long been a popular destination for Laguna Beach residents looking to grab a cocktail as well as some solace from the bustle of the city’s downtown scene. The marks of Baja California can be found throughout the cozy space, from the building’s bright pastel color scheme to the chill vibe filling its outdoor patio overlooking the water. The mood sets the scene for the menu’s list of casual coastal Mexican cuisine, like the crab ceviche or the place’s take on the classic Puerto Nuevo lobster dinner. Expected dishes --- burritos and enchiladas --- are augmented with signature items such as the massive calamari tacos and the satisfying tequila-infused borracho chicken. Creative desserts such as the banana chimichanga are a nice way to round out a meal. The early morning surf crowd stops in after catching waves and indulges in traditional fare like huevos rancheros and chilaquiles. Lunchtime brings a host of lighter offerings, including salads and American sandwiches.